We are proud to announce the addition of Dye Sublimation to our production department. Dye Sublimation is a great custom printing option for complex full color images with unrivaled clarity and vividness. We are one of the few shops in the area that offer sublimation. We are constantly adding more products and expanding our capabilities. Sublimation is the change from a solid state, directly to a gaseous state. The liquid state is bypassed. Dye Sublimation is a full color digital print technology that works with polyester products and polymer coated products. There is no textured feel to this process. Sublimation dyes are carried via liquid ink and deposited on a high-release sublimation paper to then be transferred onto the product. The print technology requires a combination of time, temperature and pressure to transfer the sublimation dyes into the polyester molecules on the product. The result of this process is a virtually permanent full color, high-resolution print that will not crack, fade or peel from the substrate under normal conditions. What products can sublimation be applied to? There are too many to list, but here are just a few. Apparel: T-shirts, Hoodies, hats, socks, aprons, Sandals, etc Decor: Clocks, coasters, pillow cases, light switch covers, etc. Phone Covers: Iphone covers, Galaxy covers, Ipad covers, Tablet covers, laptop sleeves, etc. Keepsake gifts: Wine boxes, Beverage insulators (Koozie) Jewelry, Hair Barrettes, Flip top lighters, Ornaments, Dog tags, etc. Pet products: Collars, Leashes, Dog bandanna, Pet tags, etc. The list goes on and on. Can any item be sublimated? There are a lot of items that can be sublimated, but not everything. 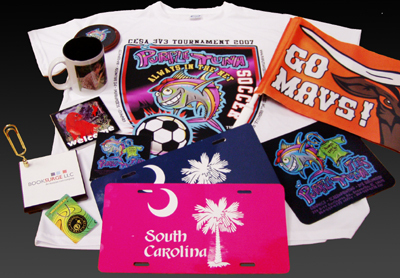 Sublimation works on polyester items, or items that have been treated with a polyester coating. Sublimation items also have to be white or very light in color. Since sublimation ink is actually a dye, it doesn’t show up when printed onto an item that is darker than the image being printed.Sublimation is a great means for producing custom gifts for your friends and family. It’s also great for team uniforms, corporate items, or just something fun for yourself. Give D&M Graphics a call at 706-855-0483, or send us an email t o tshirts@dmgraphicsinc.com and we will be happy to help you. • Photographs and Complex Images can all be Printed with Unrivaled Clarity and Vividness.